cineSync has been used by filmmakers all over the world over to create truly incredible work. It’s helped content creators, artists, supervisors and producers connect and collaborate on some of the world’s biggest and most challenging projects, even when separated by entire continents. With Gods of Egypt, however, cineSync has truly made the impossible possible. Although the production of Gods of Egypt was based in Cospective’s homeland Australia, the post-production process was truly global. 13 vendors spread from one end of the world to the other executed over 2,500 high-end VFX shots across a two-plus-hour runtime – a large and audacious project to say the least. Read on to learn how cineSync enabled such a large and disparate number of remote VFX houses to effectively work as one, making Gods of Egypt a reality. Inspired by the iconography and mythology of Ancient Egypt, Gods of Egypt tells the story of human hero Bek (Brenton Thwaites), who teams with god Horus (Nikolaj Coster-Waldau) to take down the evil god of darkness, Set (Gerard Butler). The inspiration for the film came from director Alex Proyas, best known for his work on The Crow, Dark City and Knowing, the latter of which he collaborated on with VFX supervisor Eric Durst. Durst’s own storied VFX career stretches back to 1995’s Batman Forever, and includes such highlights as Spider-Man 2 and the critically acclaimed Snowpiercer. 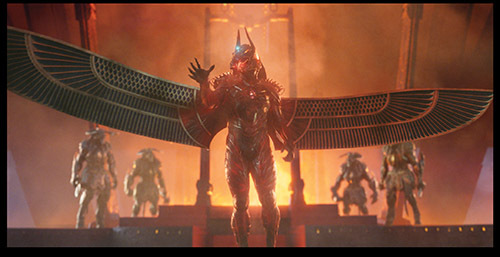 Gods of Egypt presented a unique challenge, however, in that almost every scene across the film’s runtime required a significant investment in VFX. In order to leverage Australian tax incentives, production set up shop in the heart of Australia. The Sydney and Melbourne offices of Australia’s Iloura tackled the biggest chunk of the work, taking on 957 shots between its two studios. Rising Sun Pictures in Adelaide – incidentally, the birthplace of cineSync – took on 350 shots, while Sydney’s Fin Design & Effects handled work on another 200. Meanwhile, more than 400 shots were handled by an in-house team at the Fox Studios Australia lot in Sydney, overseen by Durst and VFX producer Jack Geist. 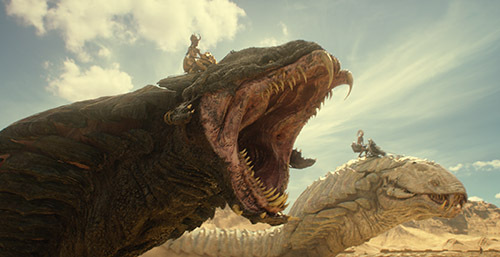 In addition to the Australian facilities, Gods of Egypt also proved a truly international production, with studios such as Cinesite in London, UPP in Prague, Rodeo FX and Raynault in Montreal, Tippett in San Francisco and Comen and Crafty Apes in Los Angeles all taking on a share of the work. With 13 total vendors used across five different countries, Durst turned once again to cineSync to maintain consistent quality across the project – and it turned out to be quite the essential tool. More than 700 of Gods of Egypt’s shots required the work of multiple vendors, with some particularly complex examples even requiring contributions from five or six different teams. From Fox Studios Australia, Durst oversaw work coming in from the myriad vendors, relying on cineSync to wrangle the various moving parts. One example of a large, multi-vendor shot was an early coronation scene occurring within a massive stadium. It’s brought to life beautifully, with sensational realism and eye-popping detail. 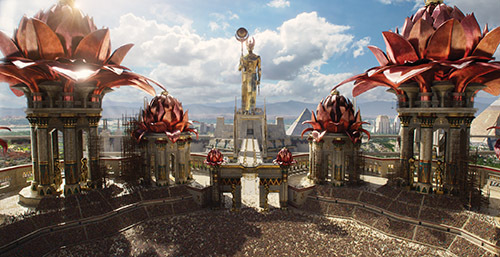 Rising Sun Pictures developed and modeled the stadium, then worked with the UK-based Cinesite on the coronation area. When Horus magically transforms into a falcon and Set into a jackal, we see another collaboration in motion. California-based Tippett performed the animation work, while Rising Sun rendered the scene and added shaders and metallic effects. Durst would hold his cineSync review sessions in two locations: in a projection screening room set up on the Fox lot, or on the 27in iMac in his office, which he found perfect for reviewing the finer details of the work. In both cases, everyone on the line would run a Skype video chat for intimate communication alongside cineSync, as well as ScreenFlow to capture everything taking place on the screen. All involved would also take notes, storing all the recordings on a shared server along with the automatically generated cineSync PDF. That way, the team could always go back to double-check what was said, ensuring no one strayed from the core aims of each shot. Early on in production, these remote review sessions typically occurred weekly with Durst, Geist, and a VFX coordinator or assistant coordinator connected with the team from each vendor. However, as Gods of Egypt reached the end of its production schedule and final deadlines neared, review sessions happened much more frequently. Once again, cineSync demonstrated its immense, especially so on a project with teams spread so disparately across the globe. One of the biggest challenges in having so many remote teams, explains Durst, is nailing the smallest details of a shot. You can have all the talent in the world – and certainly, Gods of Egypt utilized a lot of it – but an incredible amount of collaborative iteration is needed to ensure that each piece of the puzzle is a perfect fit. Durst says that cineSync was an invaluable solution for pulling off this challenge, even when working across the world’s two largest oceans. “When working on any visual effect project, the real fine increments – the last 5% that really make a difference between a shot looking great or just looking OK – that’s usually difficult to do remotely,” he explains. “That’s because it has to do with making very subtle shifts in different aspects of a shot, whether it’s lighting or the animation. 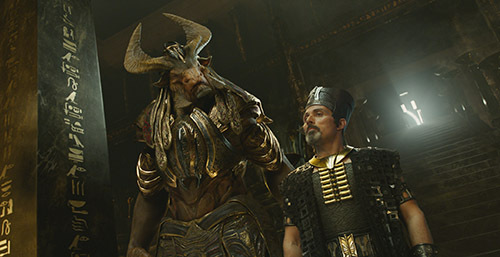 Wrangling all of that far-flung talent was a real challenge for Durst and the Gods of Egypt team, but they pulled it off, and the team couldn’t be happier with the results. 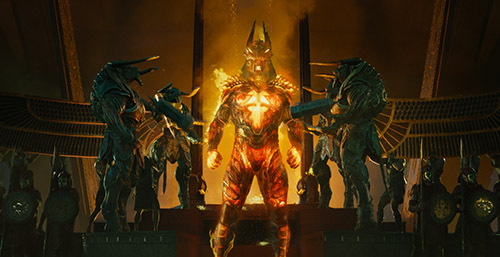 Durst believes that the Gods of Egypt production had a “humble staff” compared with the larger VFX teams on some major action films, but he’s proud of the visual variety and scale of the work achieved. For a production that seemed unlikely to happen at some points in its development – “People would say, ‘Oh it’s not doable’, especially for the money we had,” says Durst – the final result is impressive indeed.